A day when a new team member joins CineEye is always a celebration here. 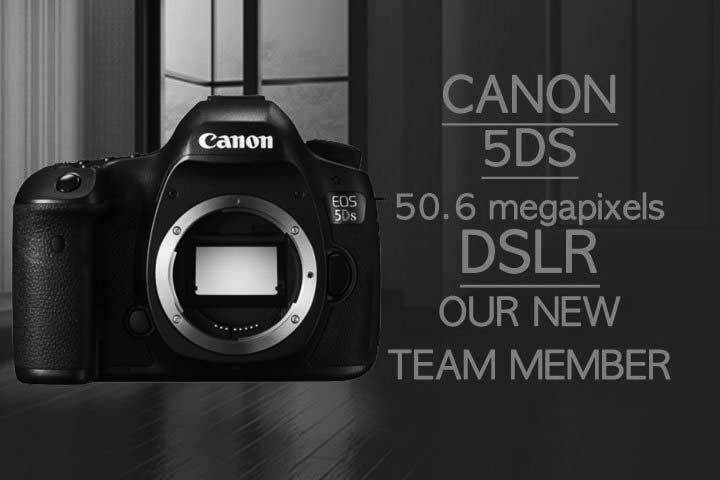 At the time of writing this post we are welcoming our new friend Canon 5DS 50 megapixel DSLR camera. The camera which at the moment ( in February 2017) has the highest resolution 35mm full frame CMOS sensor in the world – 50.6 megapixels. This is a camera which is widely regarded as a “go to” solution for studio portraiture and fashion photography. But it is versatile enough to be used in landscape photography and many other areas of photography. This extreme resolution not only let’s us capture photographs of great detail and sharpness, but also allows us more flexibility in case an image has to be extensively cropped during post processing. This is because the resolution is extremely good. That means that even after very extensive cropping we can still get images with high resolution. It must be said that we (similarly to most professional photographers) will always try to “crop images in camera”, i.e. compose a great frame during the shoot and not during the post processing. Extensive cropping is always a last resort (albeit sometimes a useful one). In addition to that we are very pleased to see that the new 5DS is compatible with majority of lenses we already own. It is also compatible with most other accessories we use for Canon kits. This is an important aspect as in photography industry the prices of lenses and accessories can be excruciating and making sure new equipment is compatible with the existing stock is essential. Another feature worth mentioning is the amazing 61-point wide area for auto focusing. This means that photographer can be more free creatively as they can focus on getting the right feel of the photograph and can reduce worries about making sure images are sharp. It must be said that Canon 5DS is probably not the best camera for those who like to double check their photos on the LCD screen. The photo preview loads much slower than for example Canon 5D Mark III. It is still pretty good speed, but compared to other cameras, it is a bit behind. This camera is also (in our opinion) not the best for event coverage. 5DS files are very large and demand better storage and processing capacity. Therefore it is ideal for intricate studio work where each photo is a work of art. Thanks for sharing this informative article. I currently have a Sony DSLR and still taking great pictures! Can you post some photos taken by Canon 5DS? I think this is also a landscape camera. Landscape photographers like higher megapixels for making super detailed images and large prints for close viewing distance. Recently I’ve bought this camera. I haven’t had a chance to shoot in low light conditions yet with it but I’m looking forward to it. in normal conditions the detail of the photos are very sharp and fine. In all honesty Canon 5Ds is not the best camera for low light conditions. 5D Mark III or IV are far better. 5DS serves best as studio or landscape camera.